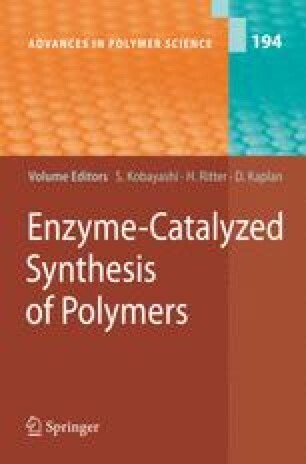 Enzymatic synthesis and properties of polymers from polyphenols are reviewed. Catechol derivatives were subjected to oxidative polymerization and curing. High-performance coatings were prepared from urushiol and its analogues using laccase as a catalyst. Flavonoids were oxidatively polymerized by polyphenol oxidase, laccase, and peroxidase to produce the flavonoid polymers. The conjugation of polyphenols on amine-containing polymers took place via the enzyme catalysis. The flavonoid-containing polymers showed good antioxidant properties and enzyme inhibitory effects.